Two smiling cats on this cat salt and pepper set. This ceramic set is called "Cats". 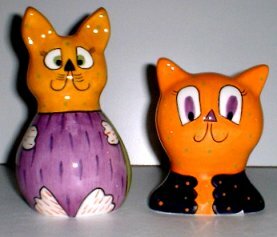 The tall cat salt shaker is 4 3/4 inches high x 2 inches wide, the smaller cat pepper is 2 3/4 inches wide x 3 3/4 inches high.